Fly Dining is the perfect example to say that we Bangaloreans are ready to experiment anything. After the massive success across the globe, Fly Dining opened their doors for the first time in India through Namma Bengaluru! FlyDining is a unique concept that enables you and your loved ones to eat, drink and be merry at the height of 160 ft above ground level and trust me, it’s an experience for lifetime. The structure is supported by one crane, which houses 22 people around the table and a staff of 4 people at its center. Even for those who are fear of adventures or heights, this experience is pleasant as the deck is safe with three belts attached to the chairs. The view from 160ft is phenomenal by covering Manyata Tech Park and lush green surrounded by Nagavara Lake! What kind of food? They serve Vegetarian & Non Vegetarian dishes for both the packages. The menu is limited and precooked. I personally felt food could have been better for the price they charge. During my visit, I was served some pineapple based mocktail, which was just ok. Followed by, Crispy Wantons – A deep fried wantons served with honey chilli sauce. It’s tasted great, however very simple though. Next, it was long grain flavoured rice garnished with Micro Greens and Mushroom Stroganoff, garnished with deep fried basil leaves. This was neither bad nor good, hopefully they will work on my feedback which I shared. The hospitality is certainly top notch and folks are very friendly. They make you special in every possible ways. So, this is absolutely suitable for occasions like special dates, birthdays, anniversaries and family get togethers well. How Safe? 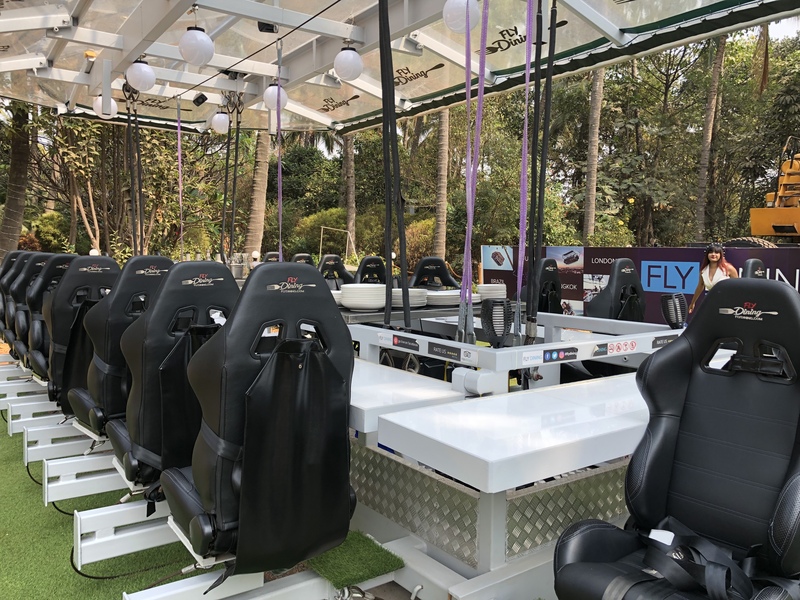 The FlyDining structure is a high-grade metal frame platform that has the capacity to seat 24 people around the table, secured by aircraft-standard safety belts on comfortable seats which can rotate a complete 180°. Fly Dining has been conceptualized and designed as per German norm EN 13814 and International Norm ISO 17842-1-2015. The table is tested and certified by German company TÜV Rhineland.